The small Greek volcanic island of Nisyros is part of the Dodecanese archipelago. Nisyros is virtually circular and has a diameter of about eight kilometres. A walk around the crater of the active volcano is a highlight for tourists on Nisyros. The Greek island has a population of just under 1000 people and tourism has become a regular source of income for them, along with the mining of rare types of rocks and the production of the traditional beverage ‘Soumada’. As Nisyros is only accessible by ferry boat from Rhodes or Kos, you are guaranteed a quiet and relaxing holiday on the small Dodecanese Island. A holiday on Nisyros means above all having a rest, admiring exceptionally beautiful sunsets and enjoying a far more authentic atmosphere than the larger Dodecanese islands can offer you. For those in search of a beach holiday there is only a limited choice on Nisyros and you are better off going for a round trip in the Dodecanese archipelago in combination with a different island. The capital of Nisyros is Mandraki, which is situated on the north coast of the island. Here you can find different types of entertainment and some spectacular views. The fishing village of Pali is only about two kilometres from Mandraki. Situated on the eastern side of the volcano, the little mountain village of Emborios perches high up on the crater rim. 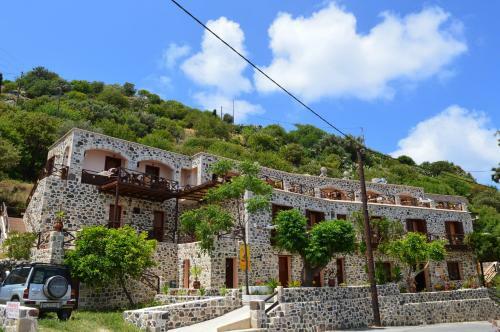 You can get there by hire car or motorbike, public transport or on foot, following the track leading from Mandraki to Emborios, past the Evangelistra Monastery, always with a spectacular view of the Aegean. Once there you can visit the fascinating volcano observatory offering visitors a close look at the crater basin of Nisyros. A unique experience for all those who visit the island of Nisyros. The picturesque village of Mandraki is the largest village on Nisyros and the island’s harbour. Picturesque whitewashed houses with blue doors and shutters, narrow little lanes, black volcanic pebbles on the beach – Mandraki is a typically Greek village with lots of taverns serving Greek food. In the centre of Mandraki those who are interested in culture and history can visit the Archaeological Museum before going for a swim in the blue Aegean Sea. Like Emborios, the mountain village of Nikia was built on the edge of the Nisyros volcano basin and can be reached on wheels via the island’s main road or on foot along the hiking-trail from Mandraki to Nikia. Those who are tough enough to walk 10 miles uphill (400 yards in height) enjoy stunning panoramic views of the volcanic landscape, the blue Aegean Sea and the neighbouring island of Tilos. The volcano museum in Nikia is definitely worth a visit too. The little fishing village of Pali is situated on a promontory about a mile from Mandrakis. As the harbour is not as busy as the one in Mandrakis that is swarming with tourist boats from other islands, Pili has room to welcome private yachts that can anchor here. Fresh fish is always on the menu of the taverns around the harbour. Near Pali you can find the most beautiful beach in the entire Dodecanese region: Pachia Ammon is a large sandy beach, the perfect place to enjoy sun, sea and a sandy beach that is still an insider hint.